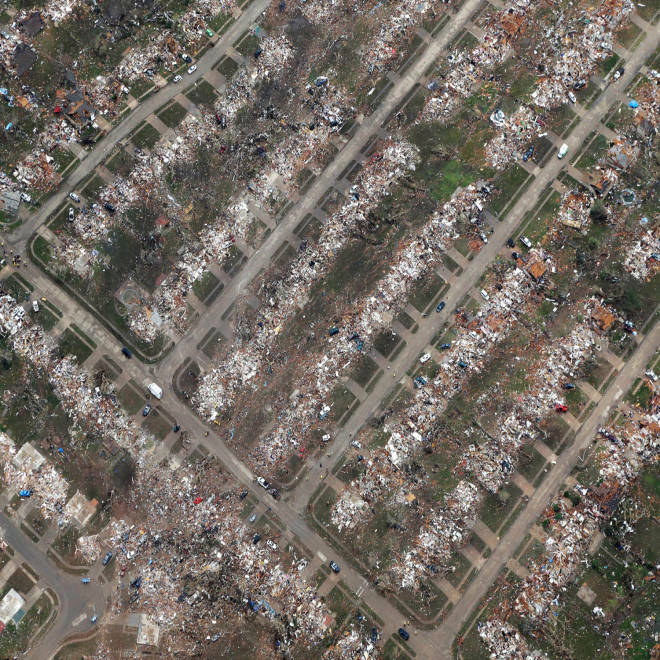 An aerial view of a neighborhood Moore, Okla., destroyed by a May 21 tornado. As America’s “Tornado Alley” braces for more storms this week, one of the nation’s top meteorologists says that changing habitation patterns have made living in the region like playing an increasingly deadly game of Battleship – where hits on densely populated targets like Moore, Okla., will only grow more common. In the Great Plains states of Oklahoma, Texas, Kansas and Nebraska, which combined are hit by an average of more than 250 tornadoes per year, cities and suburbs have grown as much as 20 percent in the past decade, while rural counties have lost population. Bill Hooke, director of the American Meteorological Society, compares tornado strikes to Battleship, the board game in which players take turns guessing where on a numbered grid their opponent’s ships are hidden. Battleships are the biggest targets. And in Tornado Alley, the battleships – the cities – are getting even bigger. “Think of the Midwest as a blank sheet of graph paper,” said Hooke, “with the towns and cities being the ships. ... When you keep adding people, and more urban sprawl, and farms turn into housing developments, tornadoes are much more likely to hit something.” That increases the chance that when a tornado hits a populated area, it will be a densely populated area. All six of Oklahoma’s fastest growing counties are in the Oklahoma City and Tulsa areas. While the state as a whole grew 8.7 percent between 2000 and 2010, suburban Cleveland County, site of Moore, grew 23 percent. Meanwhile, 23 of Oklahoma’s 77 counties, nearly all of them rural, lost population. In Kansas and Nebraska, the rural/urban divide was even more pronounced. In both states, about three quarters of counties lost people between 2000 and 2010, while the population as a whole grew more than 6 percent and suburban counties grew as much as 30 percent. After storms slammed much of the country Tuesday night, with 18 tornadoes reported from Michigan to Pennsylvania, more violent weather is expected today in the Midwest. TODAY's Al Roker reports. On Monday and Tuesday, tornadoes battered Kansas, but were concentrated in rural counties with populations of less than 11,000 that have been losing people. No injuries were reported. The increased risk to metro areas may be especially apparent in Oklahoma City, said Kevin Simmons, an economics professor at Austin College in Texas who is an expert on the economic impact of natural hazards. Oklahoma City is “the buckle of the Tornado Belt,” said Simmons. During a major tornado outbreak in May 2011, said Simmons, an EF 5 tornado swept through outlying western and northern areas of metropolitan Oklahoma City. Nine people died as the twister cut a 75-mile swathe through four counties. The tornado was similar in strength to this month’s Moore storm, which was also classed EF 5, meaning winds exceeded 210 mph. But it hit areas that were twice as far from the urban core and far less densely populated. Piedmont, Guthrie and El Reno, Okla., the three largest towns in that storm’s path, have densities that range from 83 to 203 people per square mile. Moore’s density is 1,892. “You take a similar tornado and put it through Moore, 24 people perish,” said Simmons. A monster tornado hit Moore, Okla., Monday afternoon, leaving at least 24 dead. 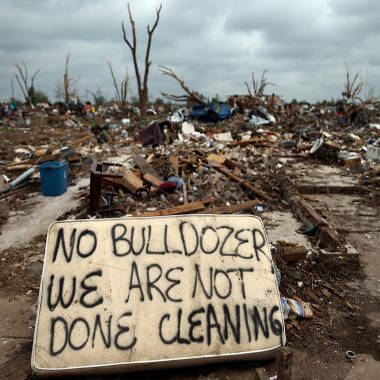 He cited the example of Tushka, Okla., a tiny town two hours southeast of Oklahoma City that was hit by an EF 3 tornado – a tornado with wind speeds of up to 165 mph – in April 2011. Two elderly sisters died in their home, but most of Tushka’s population crowded into two community shelters, one underground and one above ground, and were safe. Tushka’s shelter may be less crowded the next time a tornado comes near, however: The town's population fell from 345 in 2000 to 312 in 2010.